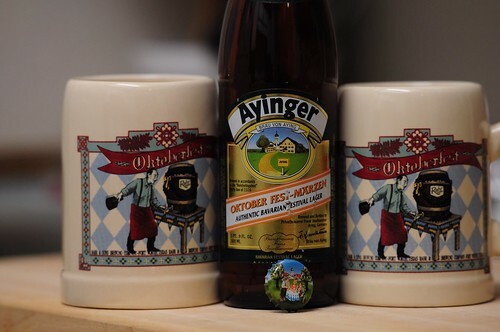 Ayinger Oktober Fest-Märzen, originally uploaded by adambarhan. A – Poured out a clear, amber color with golden highlights. It had a thick, off-white head of bubbly foam. It left some soapy trails of lace. S – It smelled of sweet caramel, some grass and subtle spice. T – It had a toasty maltiness with sweet caramel. There was a nice bitter hop character, not overpowering but just enough to add some balance. M – It was crisp, sharp and smooth. A light bodied, easy drinking lager. D – This is a really solid Oktoberfest. Cheap at the store and crazy at the bar. Tell me why its $3 and change at the store and $11 at Saucer? I dont get the markups.